THR reports the great Gillian Jacobs has joined the cast of Leigh Janiak’s Fear Street trilogy as, “a maintenance worker in a summer camp” circa 1994. Jacobs is also said to appear in at least two of the series’ entries. The modernized Grimm fairy tale starring Sophia Lillis is currently slated for a January 31, 2020 release date, according to THR. Meanwhile, the official Minecraft website has announced the long-in-the-works movie hits theaters March 4, 2022. 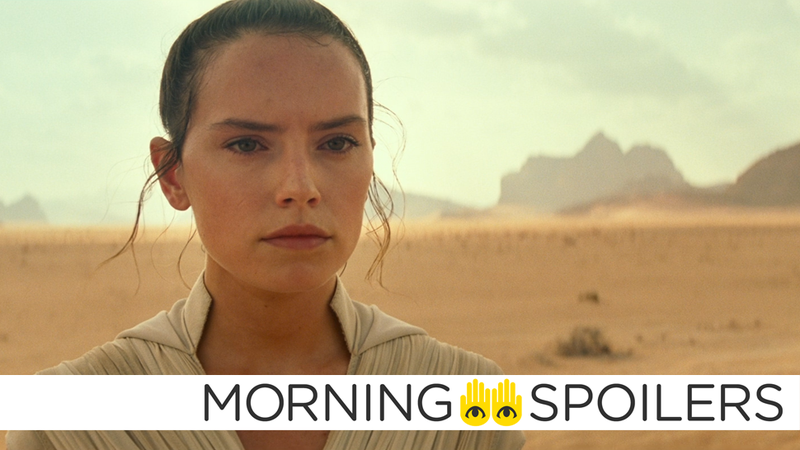 In a recent interview with ABC, J.J. Abrams declared that the movie will further explore Rey’s parentage in a way that “honors” the events of The Last Jedi—in which Kylo Ren revealed that her parents were unimportant scavengers who sold Rey for drinking money. I will say that we knew, going into this, that this movie, it had to be a satisfying conclusion. And we were well aware that that’s one of the things that’s been out there. I don’t want to say that what happens in Episode 8 [didn’t happen]. We have honored that. But I will say that there’s more to the story than you’ve seen. Here’s your first full look at Mark Hamill’s incarnation of Chucky, the Buddi doll, ahead of today’s trailer. The Observer has casting breakdowns for Zack Snyder’s upcoming Netflix zombie movie starring Dave Bautista as the “dry witted” Scott. The fifth entry in the venerable Critters franchise has been rated “R” by the MPAA for “bloody creature violence” according to Exhibitor Relations. En route to the New York Public Library, John Wick seeks safe passage for his beloved dog in a new clip from John Wick: Chapter 3 - Parabellum. A new trailer for Playmobil: The Movie differentiates itself from The LEGO Movie by openly embracing violent chapters of world history. An evil spirit haunts a newlywed couple played by Amanda Crew and Adam Brody in the first trailer for Isabelle, hitting VOD this May. A mining operation goes south in the teaser for Alien: Ore, the franchise’s latest 40th anniversary short. According to TV Line, John Cusack has signed on to star as Kevin Christie, “a charismatic and media-savvy doctor who possesses a brilliant biotech mind and a philanthropic outlook” in Gillian Flynn’s Utopia. Deadline reports Blumhouse Television plans to adapt the Gimlet Pictures’ podcast, The Horrors of Dolores Road, into a series. The story concerns a strangler named Dolores living above an empanada shop in New York City. Speaking with Trek Movie, Jonathan Frakes re-confirmed that he’s directing episodes three and four of the upcoming Jean-Luc Picard spinoff series. I’ve been booked for what they call the “second block,” which is episodes 3 and 4... I am so looking forward to it, I can’t tell ya... I think the fans are going to be thrilled and excited and surprised. I have had the privilege of reading the first couple of episodes and I have spent some time with Patrick who is so engaged, [laughs] sorry. It’s wonderful. It’s smart. I’m excited about it. The Doom Patrol take on the Beard Hunter in new photos from KSiteTV. Click through for more. David Tennant sings a lullaby for the end of the world in a new trailer for Good Omens.